We first met the very talented Katie Victoria at the Best of British show in Bristol last year. We were really impressed by her beautiful merino wool designs; so we are very excited to be launching her products on our website this week. Katie creates her fabulous products from her studio in Swansea, South West Wales. 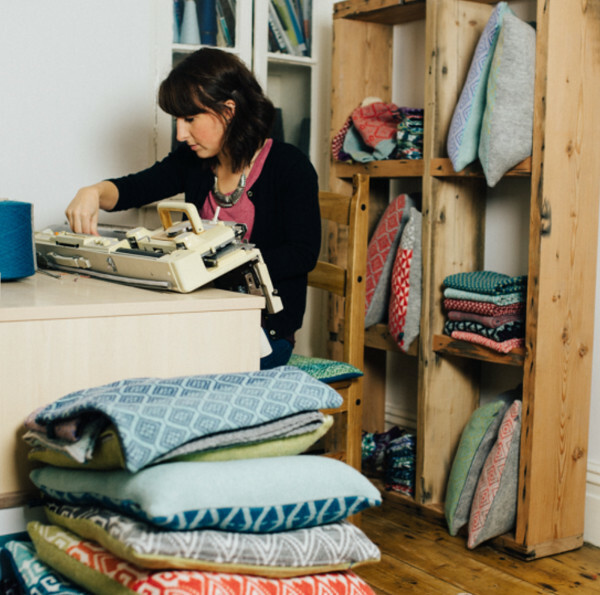 She can be found most days sat at her hand powered domestic knitting machine producing a variety of fabrics and products from cushions and hats to scarves and upholstered furniture, all made from combinations of high quality merino lamb’s wool, bamboo and cotton yarns. Katie’s designs are inspired by Moroccan tile ceramics and Scandinavian textiles. The geometric pattern, individual colour combinations and luxury finish gives a contemporary and unique look to her collections.